What would St. Patrick's Day be without a classic Irish Coffee (Caife Gaelach)? Absolutely nothing! So, I have adapted that wonderful and historical beverage here as a cold version for your St. Patrick's Day happy hour pleasure. If you prefer your Irish Coffee hot simply used hot coffee in place of the cold espresso and serve it up in a mug. This Irish Coffee Martini is a lovely adaptation of one of my favorite cocktails of all time. I lived in the Bay Area for several decades and was lucky enough to have enjoyed the original, hot version of Irish Coffee many times at The Buena Vista Cafe in San Francisco - where the original owner, Jack Koeppler, made this cocktail famous! There's a fascinating history behind Irish Coffee at The Buena Vista's website - yes, that lovely pub is still there at Hyde and Beach on Fisherman's Wharf and I encourage you to drop in and enjoy one of their famous Irish Coffees if you're ever in San Francisco! Chill your martini glass in the freezer. Pour the sugar and whiskey into your martini shaker before the ice, mix well to dissolve the sugar, then add about 1 cup of ice cubes, the chilled espresso and the heavy cream and shake until your shaker frosts over. 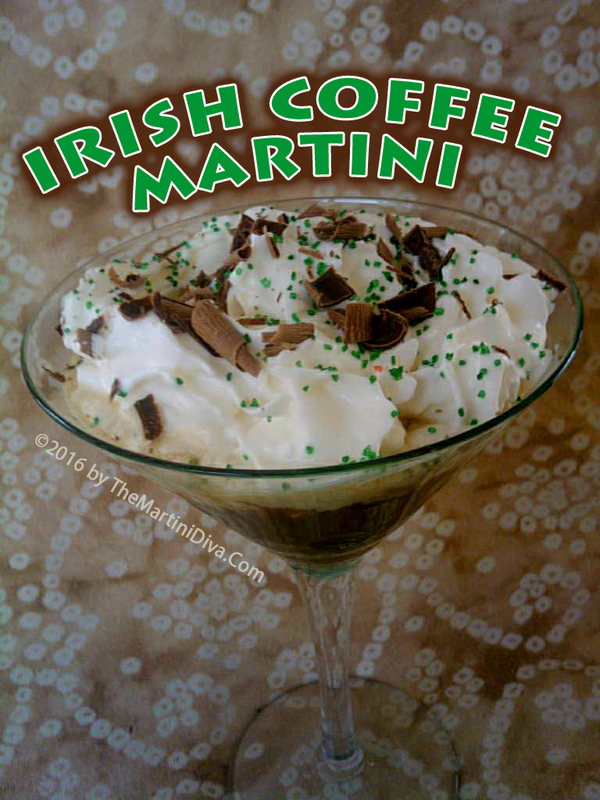 Pour this into your chilled martini glass, top off with your green whipped cream, add your sprinkles and chocolate curls, then serve. National Irish Coffee Day is celebrated every January 25th.